Team building tool that raises engagement and is great for customer service teams. 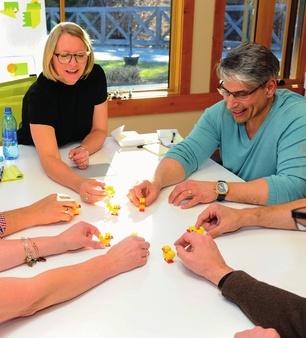 Train your team leaders with LEGO® in this workshop - filled with practical tools, strategies, and activities you need to supercharge employee engagement and performance. "Let's tap into the unique creativity and energy in the team so that they bring their best to work. This high level of engagement leads to an enduring culture of top performance and excellence." Introduce play and fun into the workplace. 'What The Duck!' is your fire-starter to move things forward in your own company. 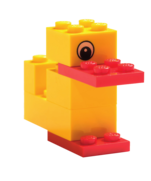 In our 1-day workshop, we demonstrate and give you the opportunity to practice facilitating a whole range of activities with the LEGO® SERIOUS PLAY®-based 'What The Duck!' system. This is your time to truly engage your team members and set them up for success. Hold onto them, keep their enthusiasm and keep their spirit up where it should be - high! Ongoing team huddles - if you aren't doing a team huddle at least weekly, time to start now. Activities to celebrate events such as hitting targets or achieving KPIs. Build resilience in times of change. Strategies to invigorate time spent with team members. Activities to close off the year or a special project. Learning's are meant to be shared! "I can attest that MCI Solutions absolutely deliver on their promise of innovation"
Quality corporate development. Innovative digital delivery. We're at the forefront of defining and using innovative unique training methods. We set industry standards, others seem to agree. We've won 25 awards over the past 9 years. We know business and education. Count on us just like the many ASX companies who have trusted us to train their staff for over 10 years. Our qualifications are nationally recognised by Government and have influenced businesses nationally. We tailor our training to target your company's specific learning and development needs.